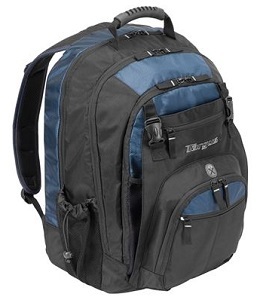 The Targus XL laptop Backpack is perfect for the laptop user who carries their life on their back. This pack provides ample space for laptops with up to 17” screens and also includes a main compartment for files. Additional storage areas include a mesh water bottle pouch and a soft pouch for sunglasses. Designed for comfort, this backpack has a place for everything. Main compartment for file storage includes soft organizational shelf. A foam padded laptop compartment helps absorb the shock of regular use and protect your laptop from other objects in your bag. Side water bottle pocket and side pocket lined with protective material for safe sunglass storage. Extended compartment space for those who pack expecting the unexpected. Audio player sleeve with line-out porthole for headphones. Separate, padded laptop compartment fits most laptops with 17” screens. Extra file and accessory storage throughout the backpack. Exterior Dimensions: 15.5" x 20.5" x 8"
Interior Dimensions: 16.5" x 2.2" x 12.9"